A sense of unworthiness is probably something most of us experience at some time or another. We may feel unworthy for a particular task, unworthy of another's trust, unworthy of another's love. And that's not surprising. We know our failings and our weaknesses better than anyone. I guess this sense of unworthiness is most apparent in the area of our relationship with God. There is awkwardness when confronted with God’s invitation. Why would God choose me? Why me? I don’t think I have it in me to respond to his call, accept his invitation and be a witness to his immense love. But this hesitation to heed the call of discipleship may have less to do with genuine humility than it has to do with a rather selfish, narcissistic and self-serving cultural influence. We can all recognise the self-centredness of our contemporary culture, a culture that constantly believes that we are self-sufficient and that it all begins and ends with “me”. It’s a culture that makes us believe that you can’t achieve or get anything unless you work for it, or unless you deserve it, or unless you’re born with it. It’s a culture where personal merit counts for everything. Here is the good news. And trust me, it is good news: God’s love and choice is not about personal merit. It's not all about you. You are loved and chosen in spite of the fact that you don’t deserve it. We are all that lost sheep that the shepherd goes in search of. Now... could that take the pressure off a little? Yes, it can when we come to recognise that the call of discipleship, the call to witness to the love of God is often too heavy for any man or woman. That is why it is sheer humility that recognises that we can accomplish nothing without Divine Assistance, without being propped and held up by grace itself. It is a recognition of the truth, albeit a painful one, that Christ actually doesn’t need us. It may not sound like it, but that's Good News. Why? Because none of us are capable, on our own, of fulfilling the good works that God has called us to. We can't make it on our own, and if everything relied upon else, it'd be a disaster. Instead, we need Him. We - priests and laity alike - need to turn over everything to Him, holding nothing back, and entrusting all to the Holy Spirit. Without refuting this, but recognising his humility, it was Mary who addressed him lovingly as “Juanito, Juan Dieguito”, "the most humble of my sons", "my son the least", "my little dear". “My dearest son, you must understand that there are many more noble men to whom I could have entrusted my message and yet, it is because of you that my plan will succeed.” Yes, there were certainly many other more credible, more qualified candidates to witness to our Lady’s favour. And yet it was to this “little one” that found favour in Mary’s eye. In Juan Diego, we indeed see the example of one who has been called and chosen to bear witness to God’s love. Such love is truly gratuitous, it is unconditional and unmerited. The lesson provided in the choice of this simple witness is that a true gift or giving is not to be based on receiver’s merit or else it is a reward: It should not be based on the condition of recipient’s worthiness but of the willingness and generosity of the giver. 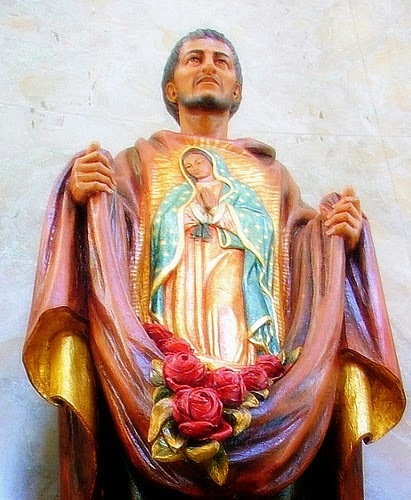 In fact God, through our Blessed Mother, chose to grant this favour to Juan Diego, though he was unworthy of it. That in itself is testimony of the depth of God’s love. But if the choice had nothing to do with Juan Diego, what part did he play? What part can we play in this whole divine saga of God choosing us to be his witnesses. Here is the truth, a truth that has been spelt out throughout the pages of Sacred Scripture and across the Christian centuries in the life testimonies of saints, confessors and martyrs: The act of giving always create choices or conditions: the acceptance or rejection. Receiving requires unconditional acceptance; you can have it if you will accept it. You can’t have it if you reject it. And so we have the prophets, the apostles, the saints and martyrs – they were presented with the choice of either accepting or rejecting God’s choice of them. And they chose it, as did Juan Diego. Often, it's when we are at our lowest, when we have failed, when we are most acutely aware of our weakness, that the Lord comes to us and works his wonders. It is to the lost sheep that the Shepherd comes in search of. And it's then we have to trust in him, to launch out into deep water, knowing that it's not our strength or our talents that matter, but his. St John Chrysostom reminds us that as long as we are sheep, we overcome and, though surrounded by countless wolves, we emerge victorious; but if we turn into wolves, we are overcome, for we lose the shepherd’s help.” At every mass, we utter the act of humility when the Body of Christ is lifted up, “Lord, I am not worthy that you should enter under my roof, but only say the word, and my soul shall be healed.” And at every mass, we witness the great miracle of his love – the Eucharist! I’m sure that many of you are aware that St John Paul II named Our Lady of Guadalupe, or Our Lady of the Tepeyac Hill as the ‘Star of Evangelisation.’ And the main thing for that title is because of what happened afterwards; so many conversions took place. Till that time, Christianity was seen as a foreign religion and tool at the hand of the invading colonialists. But after the apparitions to St Juan Diego, thousands of Indians began flocking everyday to the missionary centres seeking baptism. According to records, some priests had to baptise as many as six thousand people a day. This evinces that conversion is always the work of God, not that of men. We are merely poor instruments who bear witness to his Love. Today, we continue to invoke the prayers of Our Lady of Guadalupe, the Star of Evangelisation, we pray for the grace and the courage to bear witness to God’s immense love. And if there is still anyone out there who feels intimidated, who still feels fettered and weighed down by a sense of unworthiness, that we are not good enough or could never measure up to God’s demands, well let’s remember St Juan Diego – a living proof that you need not be someone important, eloquent, well-educated, talented or good at public speaking to be a witness of God’s love. The fact that you are not all these things and yet God has chosen you is proof enough of the message you’ve been commissioned to proclaim. Please note that foul language will not be tolerated. Comments that include profanity, personal attacks, and antisocial behaviour such as "spamming" and "trolling" will be removed. Violators run the risk of being blocked permanently. You are fully responsible for the content you post. Please be responsible and stay on topic. Pope Francis: Religious who pray for Christian unity an "invisible monastery"
Rejoice! The Lord is Near!